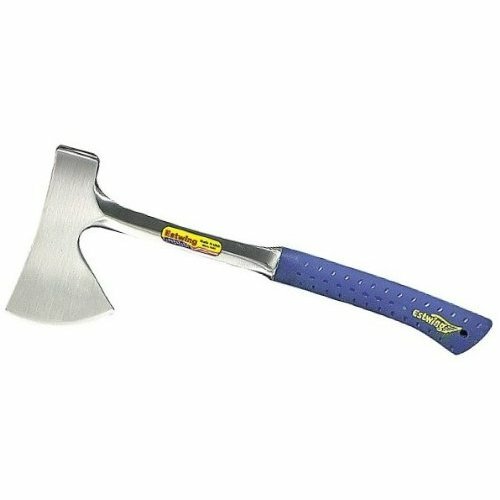 The Estwing 16 inch camper's axe is the ideal axe for camping, hunting and farm use. It has a forged steel head with a steel handle. The 4" cutting edge makes a deep fast cut. Includes a leather sheath. Lightweight but tough for cutting and chopping small to medium size wood and branches for fire wood! Protect your eyes from flying particles and dust. Always wear safety goggles. Bystanders should also wear safety goggles. * Great for use on camping trips! Striking tools from Plumb®, a brand from APEX Tool Group, were first produced in a small Philadelphia blacksmith shop in 1856, and Plumb® has since risen to become the most popular brand of hammers and axes in the world. The Plumb® story has always been one of superior product quality and durability. Today that tradition continues with high quality Plumb® hammers, axes and hatchets.